It's this time of the year! We are all searching for a perfect gift to give to our loved ones. 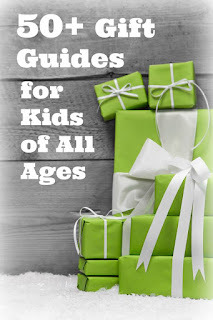 Kid Blogger Network keeps you covered with gift guides for every age group, gender, and interest your kids might have. Yet again, I decided to write about games - fun games for thinking kids - for kids who enjoy puzzles and challenges. Disclosure: I am an Amazon associate, and this post contains Amazon affiliate links. For full disclosure, please click here and thank you for supporting my blog! Some of the games were received from ThinkFun for review, but all opinions are entirely my own. 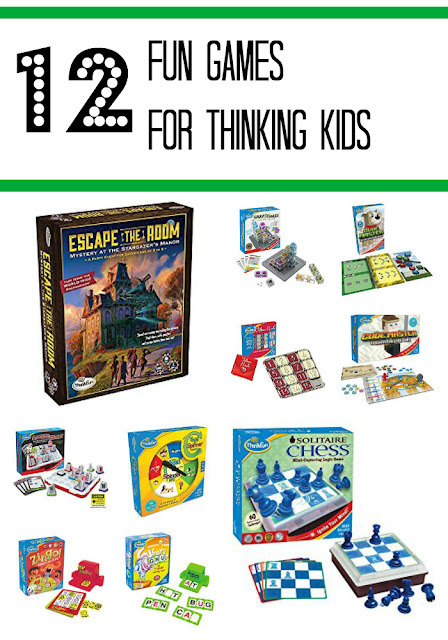 What do you look for when selecting games for your kids? I think it depends strongly on the size of your family. My friend MaryAnne wrote recently how she likes games that promote sharing between siblings and allow her four kids to have fun together. I have an only child, so I like games that don't require company to play even though they can be played in a group. 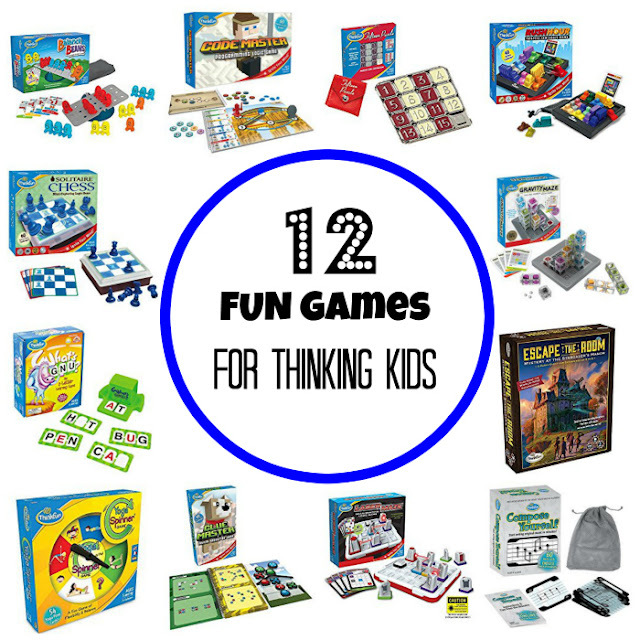 Not surprisingly, over years we ended up with a lot of games from ThinkFun, the company that really tries to live up to its name and make thinking and logic fun. We own every game on my gift guide list, and I ordered them by age - from the ones appropriate for the youngest children to the ones better suited for kids 8+. Yoga Spinner Game is recommended for ages 5+, but my 10 year old and her friend from across the street love playing it together. This game does require 2 or more players as some poses need to be performed as a team. Smarty loves this game, because it requires movement and stretching, and her friend loves it because usually she wins (she is in a competitive acrobatics class). Anyway, the game is fun for different ages and light on reading, so even pre-readers can play it independently. 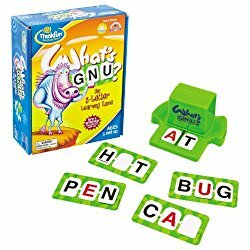 We had What's GNU? when Smarty was about 4 years old, and she enjoyed this game a lot. Now ThinkFun has several other popular Zingo games that are based on the same game mechanics of reacting to a new character or number appearing out of a card holder. These games are most suitable for preschoolers and kids in kindgergarten or first grade. 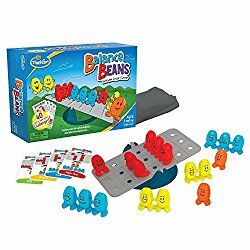 Balance Beans is another game that we got for review recently. Initially, my daughter found it a bit too easy, but the challenge cards that come with this game progress quickly from very easy to quite hard. This game is designed for ages 5+, does not require reading, and subtly introduces kids to logic and algebra. In fact the game reminded me somewhat of a popular DragonBox app, but taken to an actual physical form. 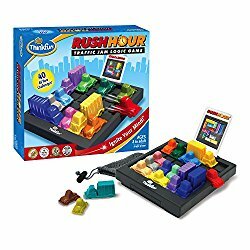 Rush Hour is another classic thinking game from ThinkFun. There are several version of this game available as apps, but, honestly, I think that younger kids benefit a lot more from physically moving the pieces than just spending time on the phone or the tablet. The game is officially targeted towards ages 8+, but Smarty was perfectly able to tackle easier levels at 5 or so. 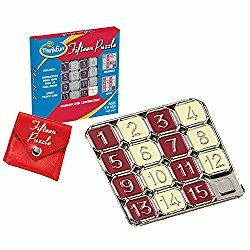 I was so happy to find Fifteen Puzzle in the store several years ago. It was one of my favorite games when I was little, but this version has an advantage of pieces cleverly set into a square, so they don't fall out. I love watching Smarty figuring strategies to get the numbers into the right spots! 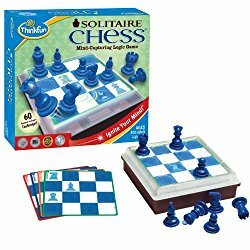 If your child is interested in chess, Solitaire Chess can be a great way for them to practice independently. We got it as a gift a couple of years back. The main drawback to the game is that it's not really that challenging even if you are only an average chess player. On the other side, this is why it's good for kids who are just discovering chess - they can feel more confident quickly. 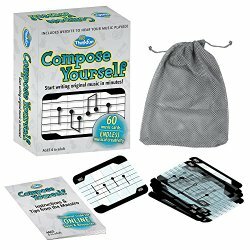 We got Compose Yourself for review last year and I wrote about it in this post. Honestly, I feel that the game could have been better with tighter integration between its pieces and its digital replay (like being able to save melodies), but it can be a good gift for kids who are passionate about music. Technically, Laser Maze could also have an online equivalent, but it's a lot of fun to play it as a 3D game. 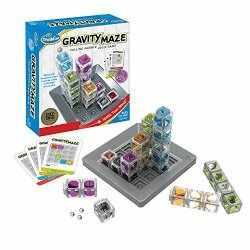 It's similar to other ThinkFun games in game mechanics - a set of challenges of various degree of difficulty, but the hard ones are really hard, even for my visually-spatially oriented husband. Mechanically inclined kids will spend a lot of time figuring those challenges out! 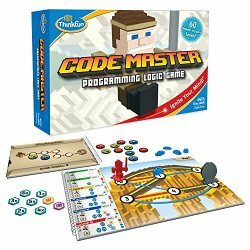 We got Code Master for review last year, and I wrote about it here. It's a clever game, and Smarty actually has it out quite often working randomly through different challenges of the game. The only wish I have for this game would be for the pieces to be more durable, preferably plastic and not cardboard. The game is targeted towards kids age 8+, and it seems like a fairly accurate age estimate to me. Clue Master that we received for review this year is a sibling of a Code Master - even its box looks similar. 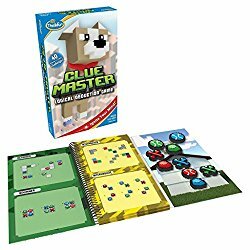 However, Clue Master does not attempt to teach kids programming, it focuses purely on logic. The level of difficulty goes up quickly, and our entire family enjoyed the puzzles quite a bit. 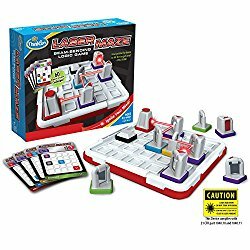 This game could be a good addition to brain breaks times for homeschoolers or could also be used in the classrooms for fast finishers. 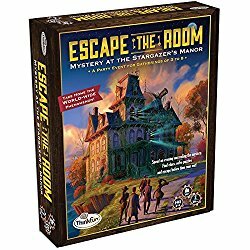 Escape the Room is the only "party" game on this list that is better with more than 3 people. We received this game for review, and we waiting for my parents to come over for Thanksgiving, so we can play it together - because, unlike classic Clue game, once you played it once you know the secret. However, Smarty is very excited about this game, since she heard about real Escape the Room experiences and she wants to try them too one day. 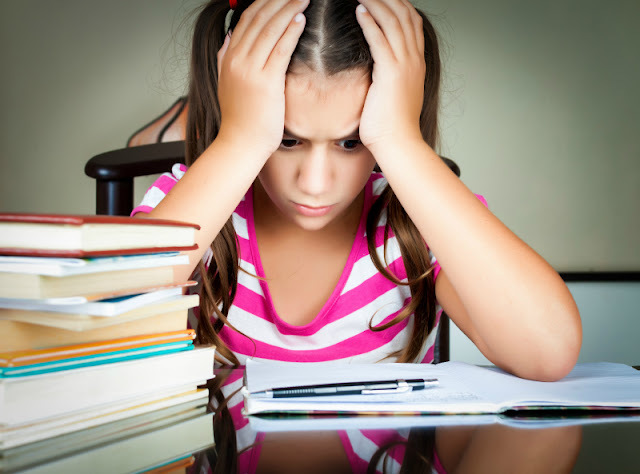 What brain games do your kids enjoy? More Gift Ideas for Kids? I could see my son loving solitaire chess and compose yourself. 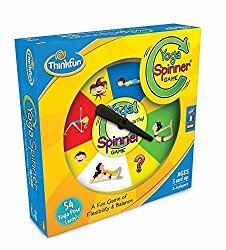 My kids enjoy Yoga spinner, and balance beans is one I have on my wishlist. You have excellent taste in games! You found some great games and toys. I'm excited to go shopping off your list!